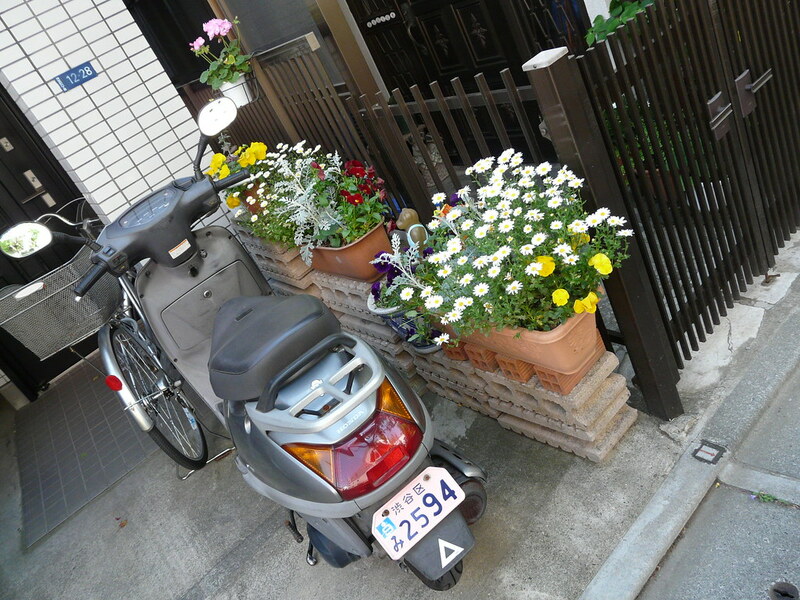 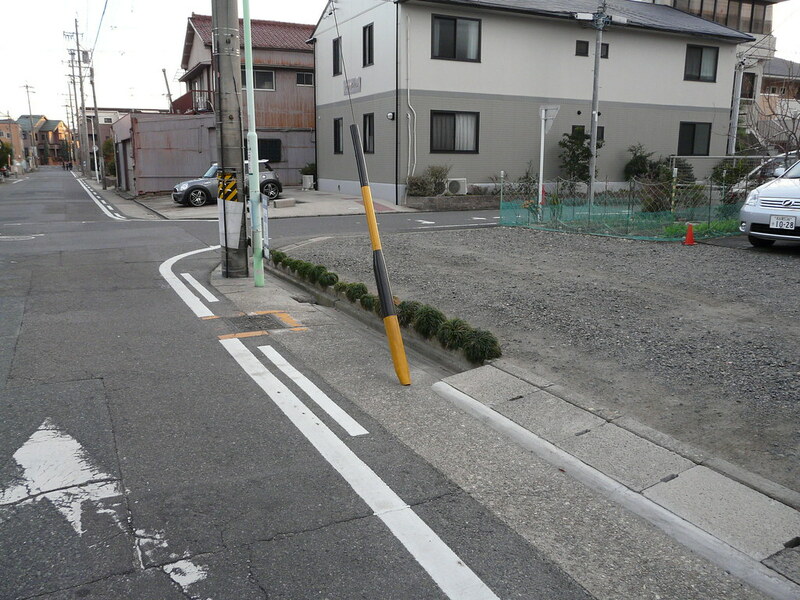 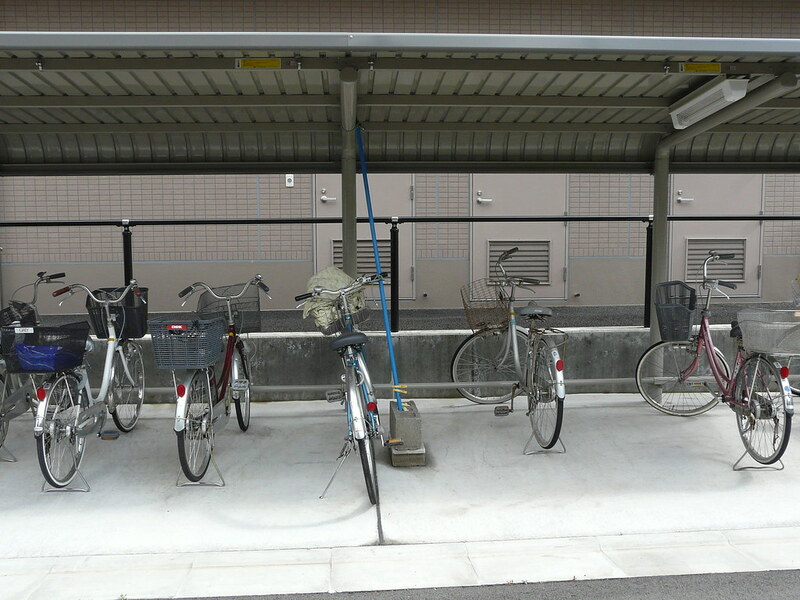 Particularly intricate stabilisation system for parked bicycle. 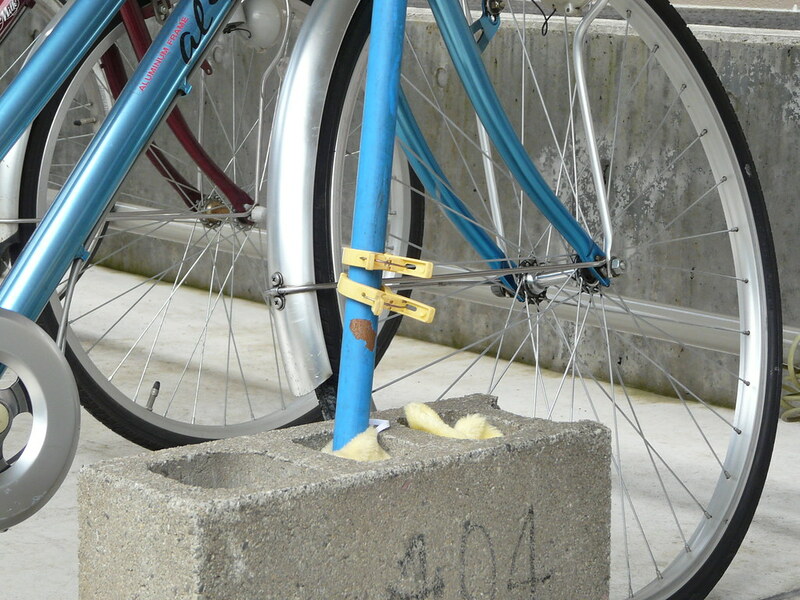 Prevents the bicycle blowing over in the wind, or being toppled by other errant parkers. 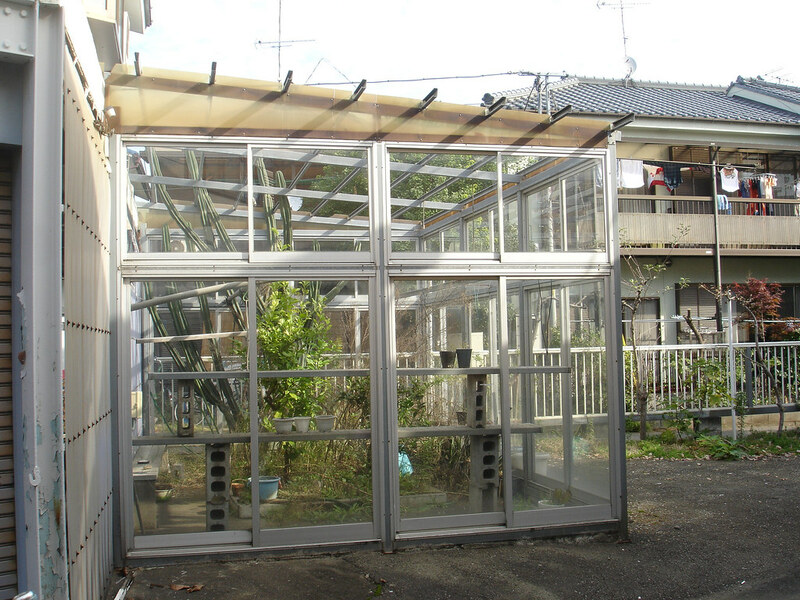 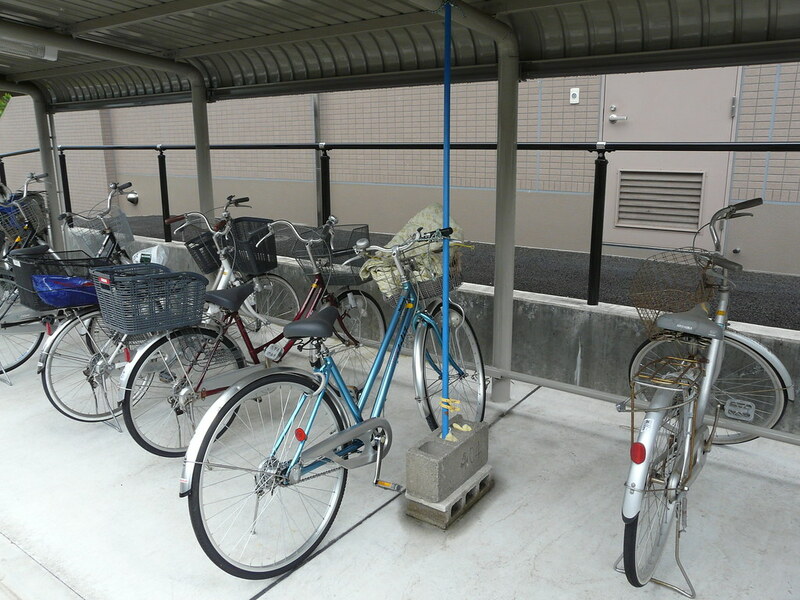 It also provides a central stable element to prevent the whole row of cycles from falling in a strong wind. 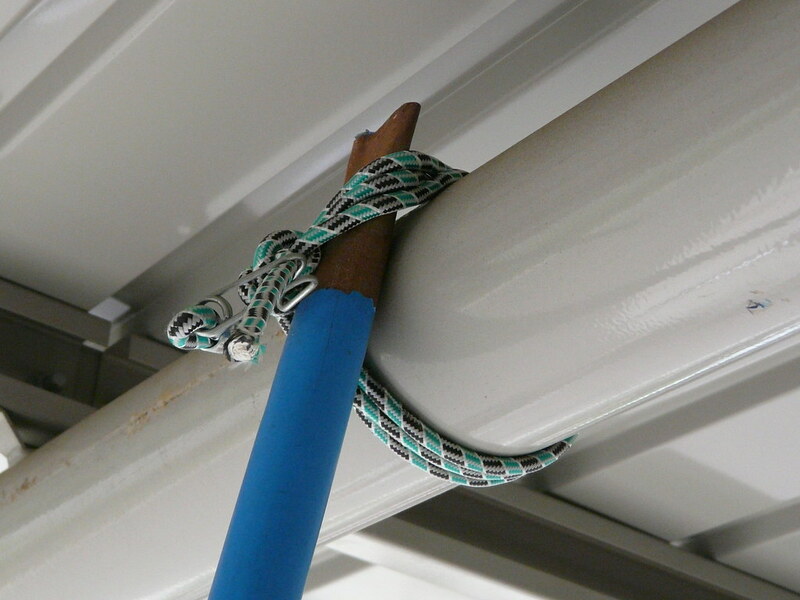 A laundry pole is fixed to the parking structure with bungee cords at the top end. 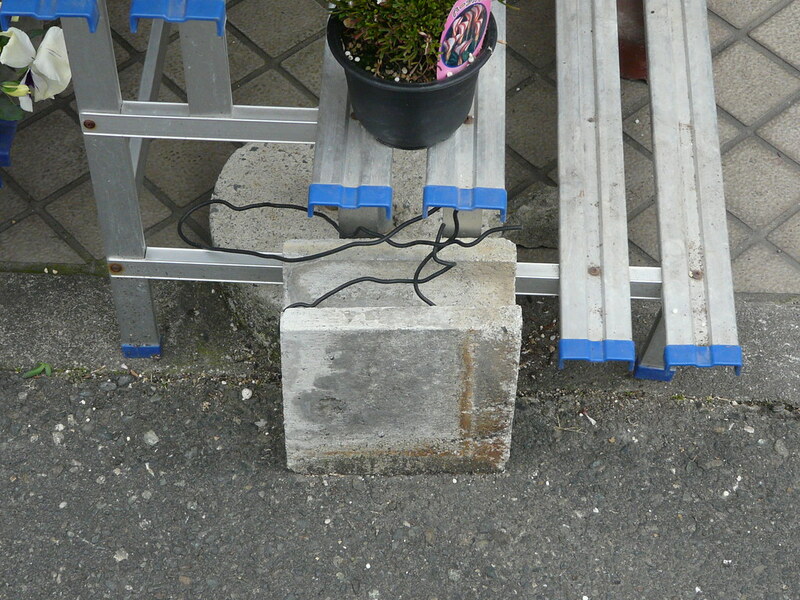 The bottom is stablised with breeze blocks and blanket scraps. 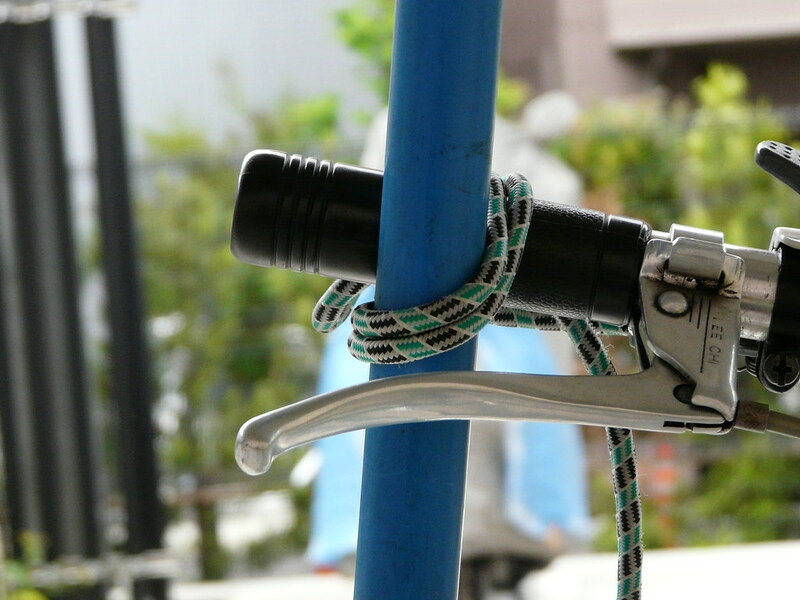 The bicycle is attached to the makeshift structure with another bungee cord. 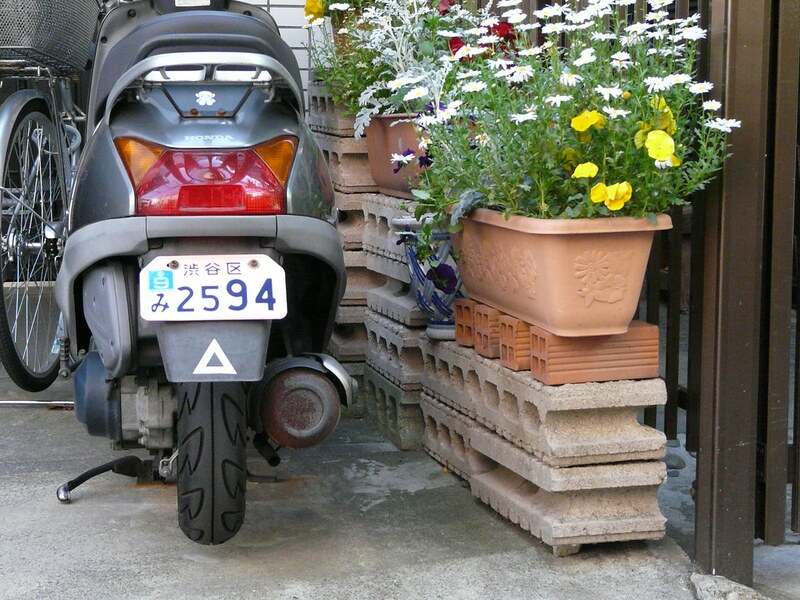 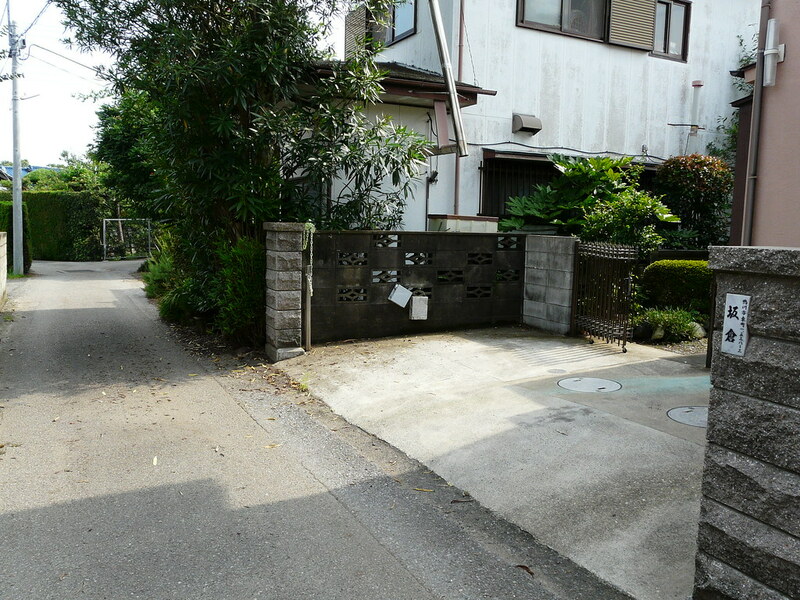 The number written on the breeze block denotes the owner’s apartment number. 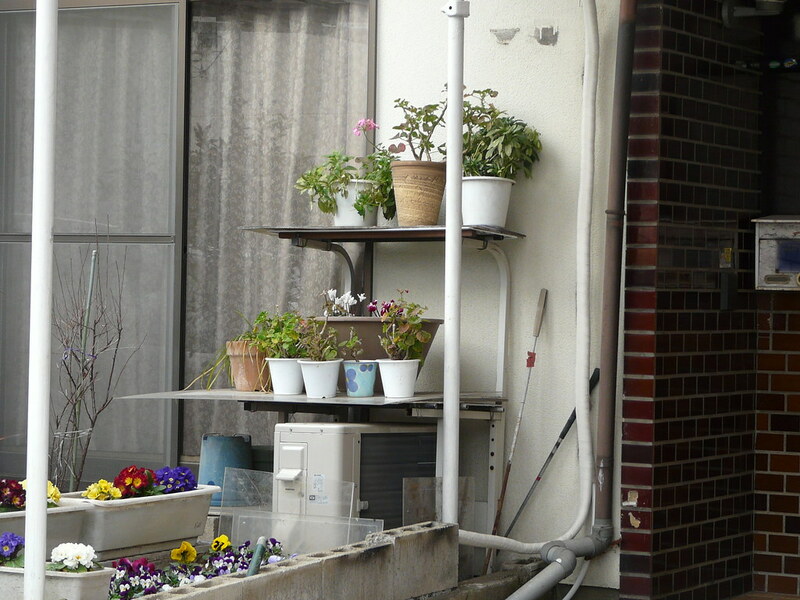 I’m not sure of the function of the pegs and gloves. 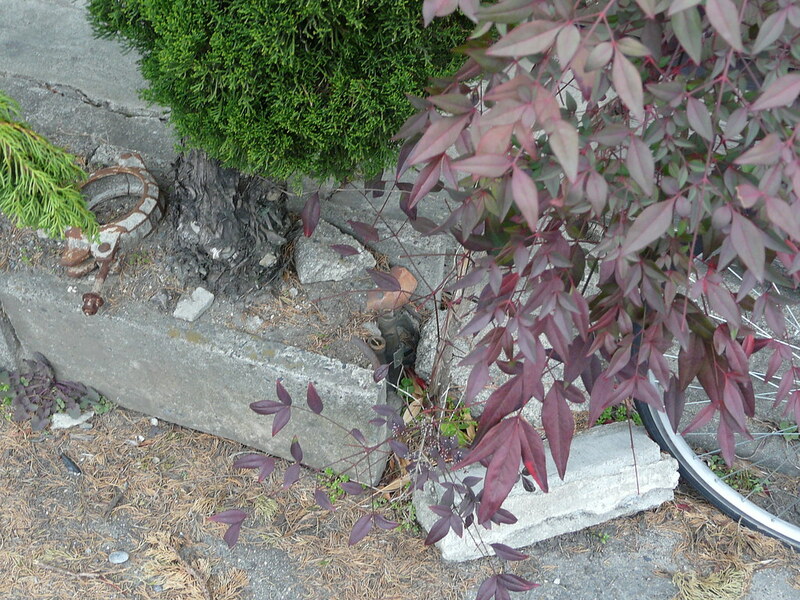 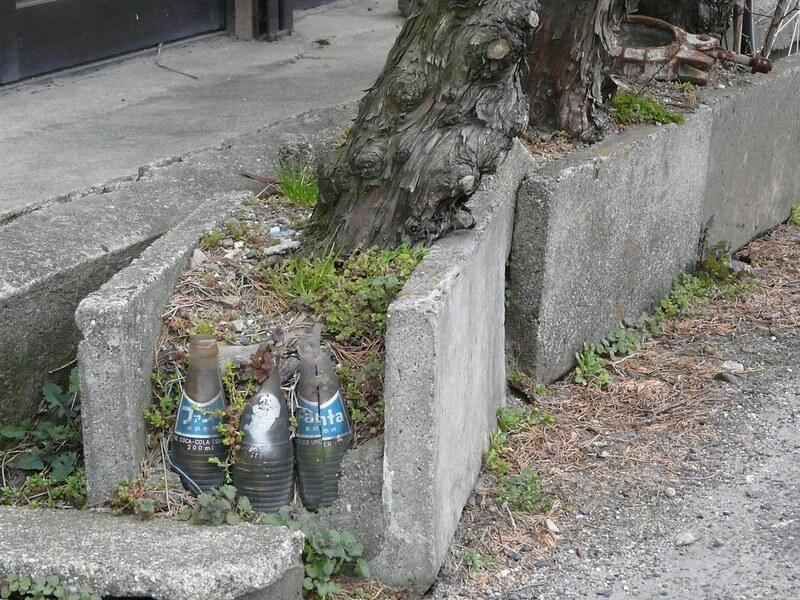 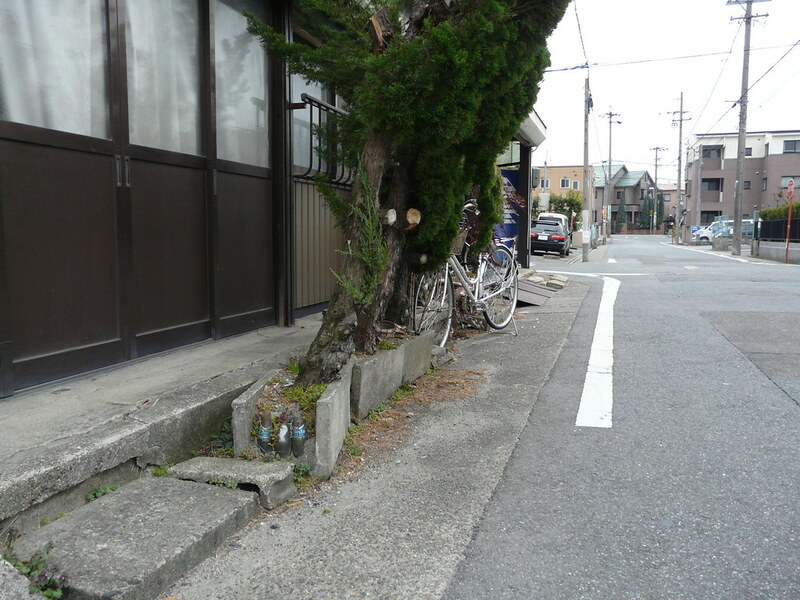 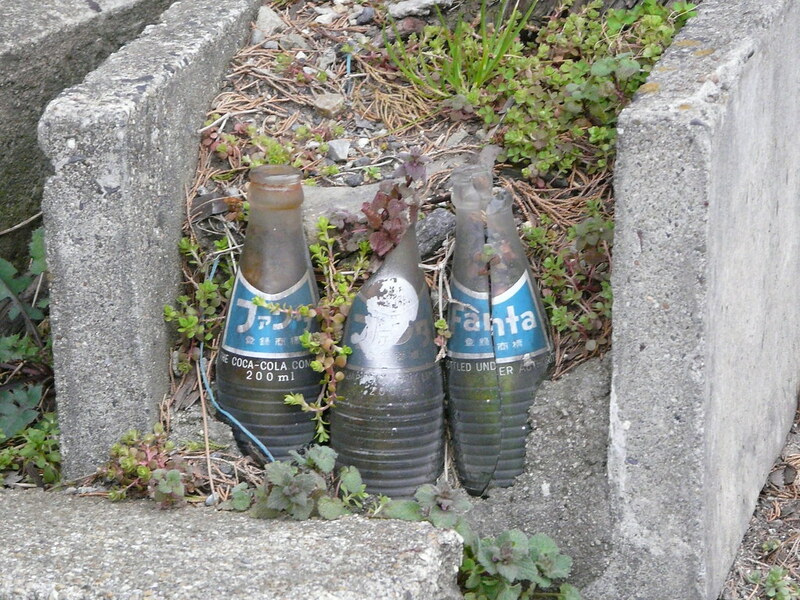 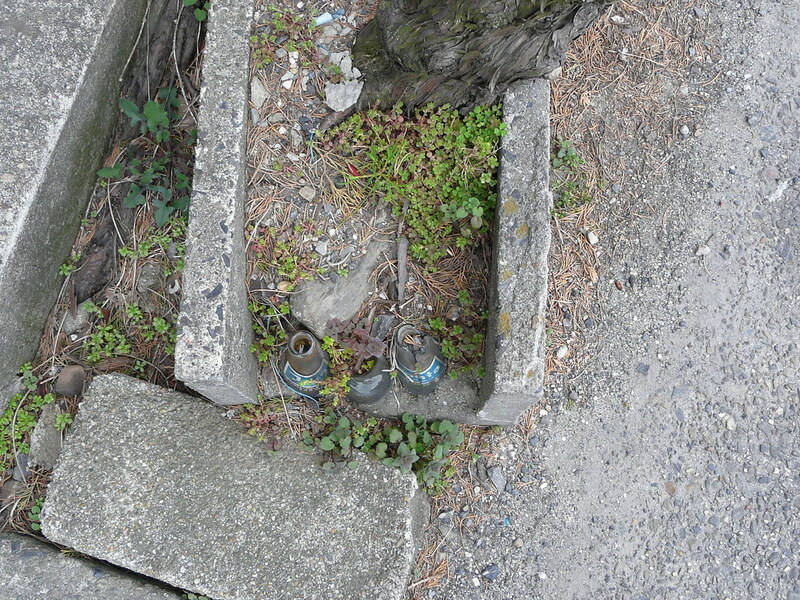 Judging from the bottles concreted into the ends of the breeze block planters, these trees have been here for decades. 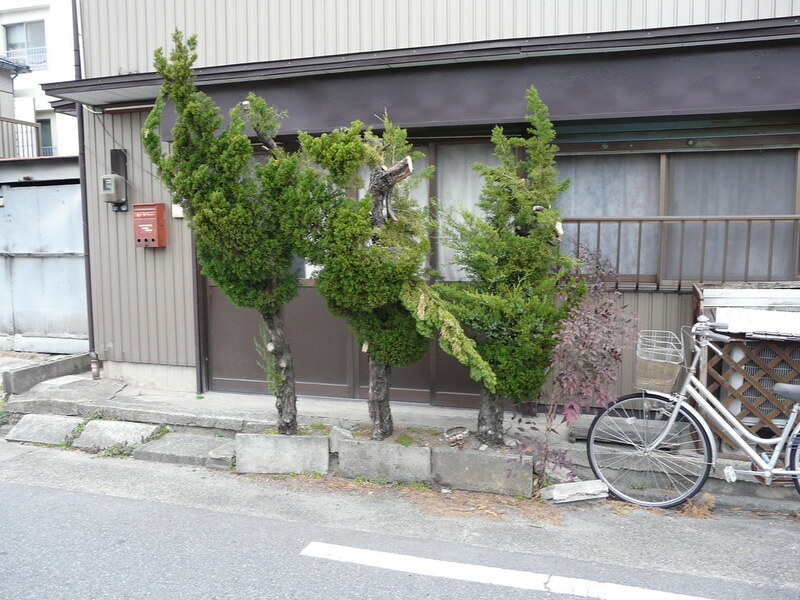 They seem to have adapted their growth to the cramped residence while becoming large enough to provide a modicom of privacy and shade. 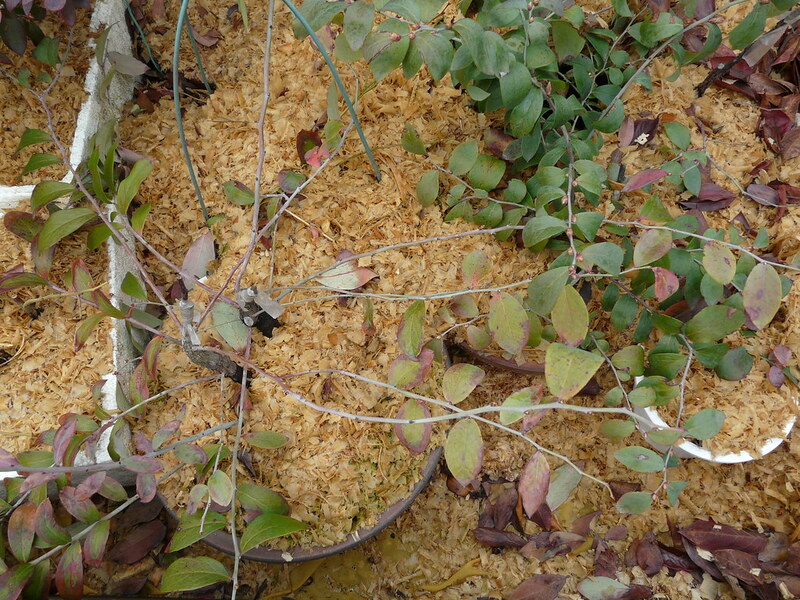 Fresh pruning evidences ongoing care and attention. 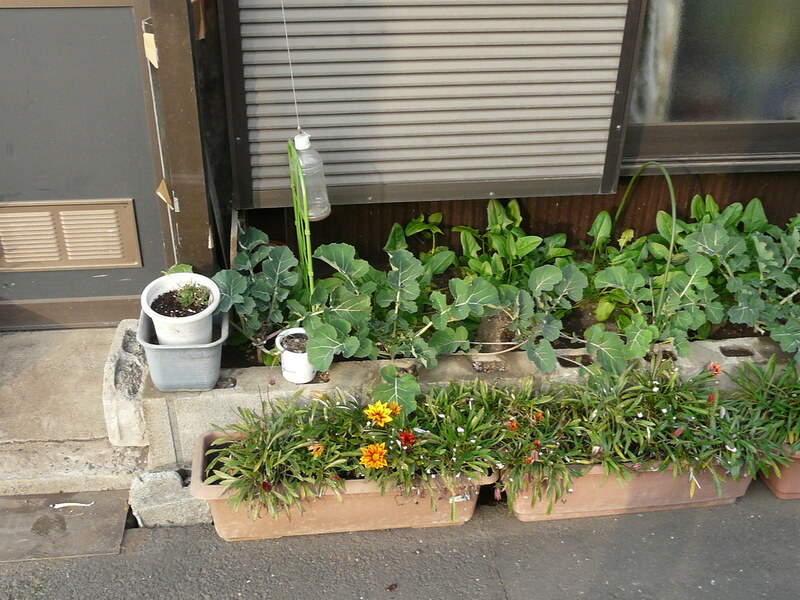 I’m impressed that large plants could be grown in such an unforgiving, soil-less environment. 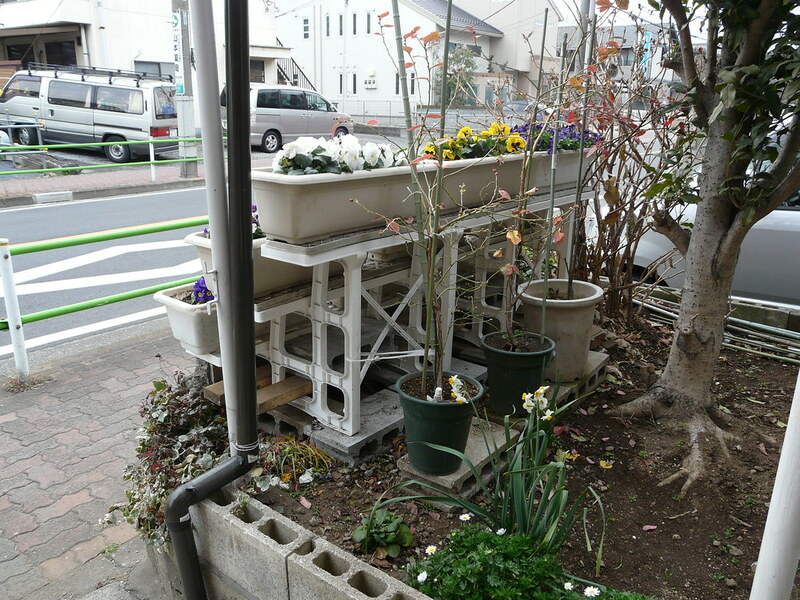 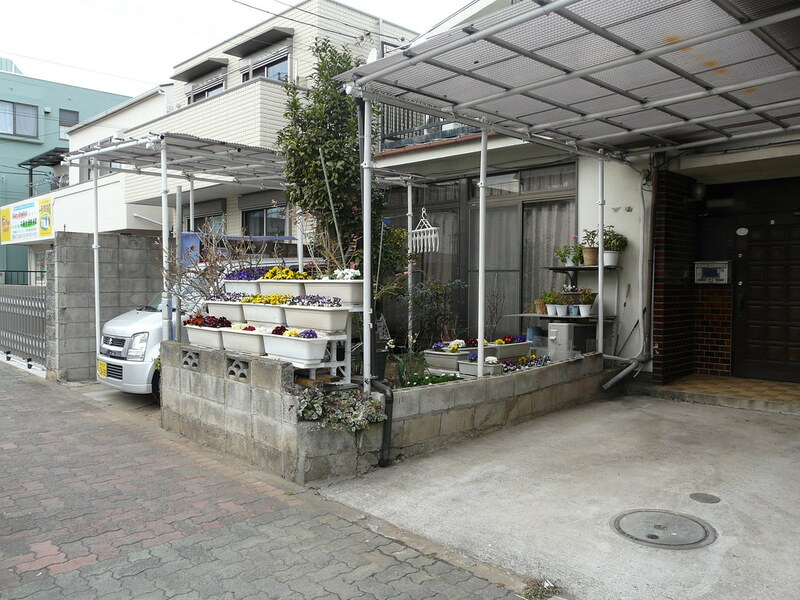 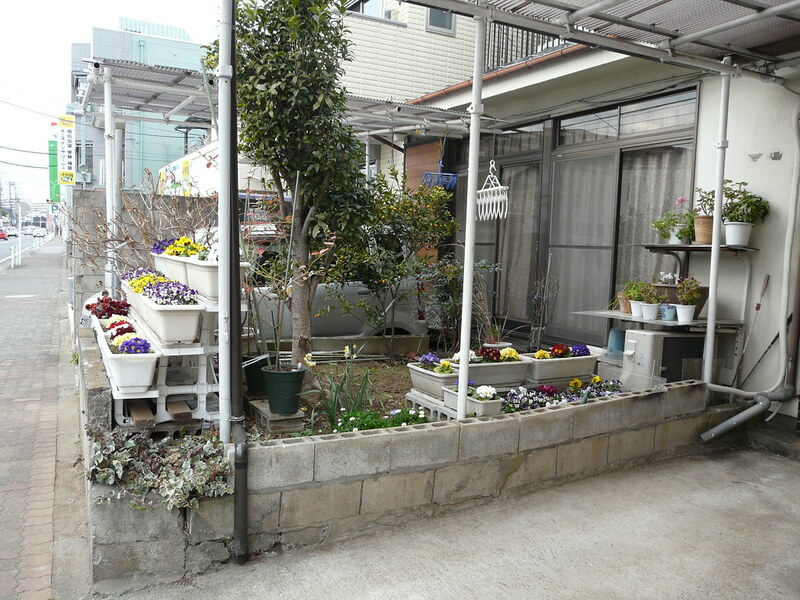 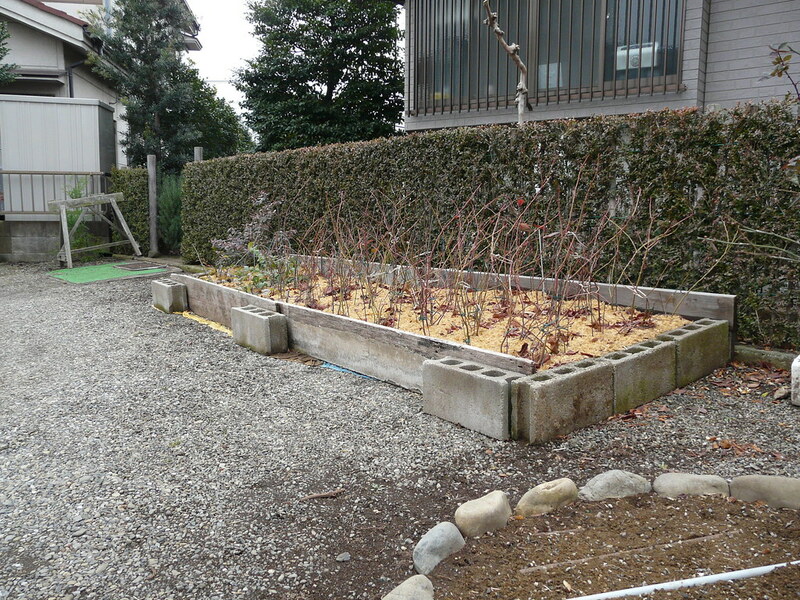 Curbside tiered garden constructed on a base of two step benches, secured with breeze blocks and wire. 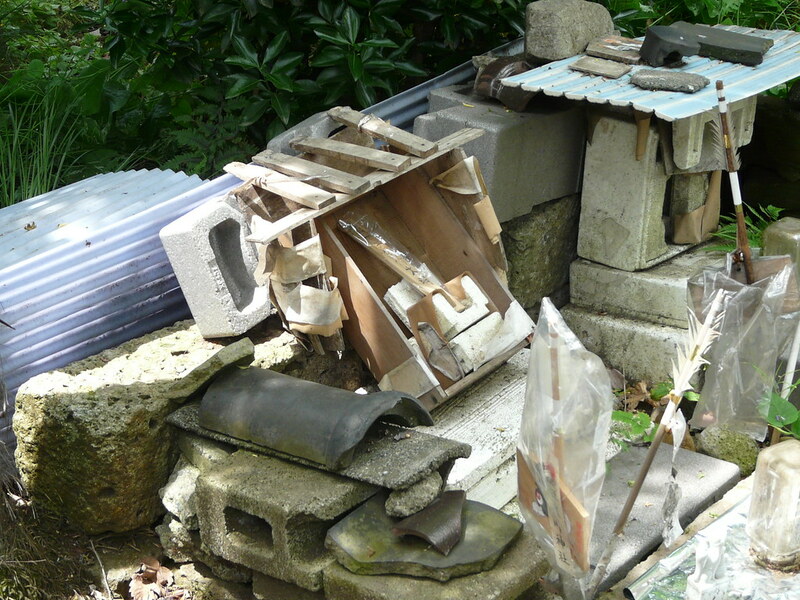 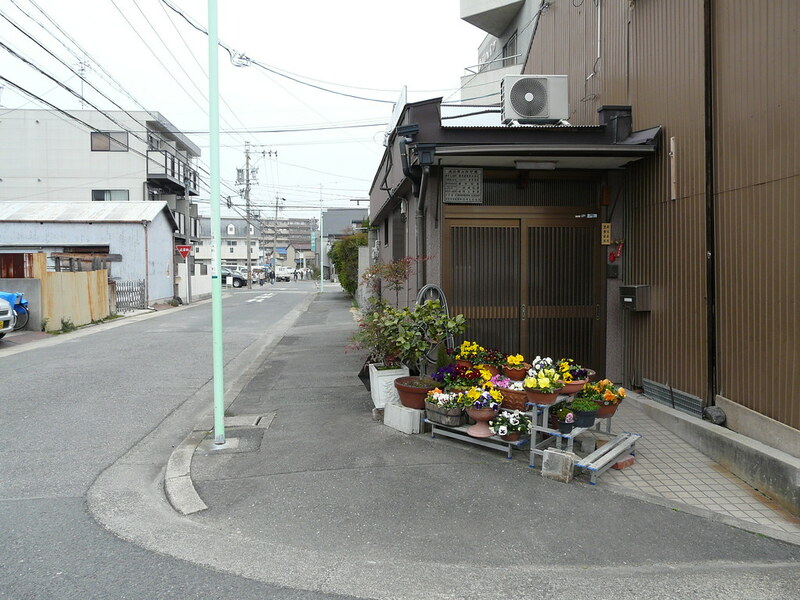 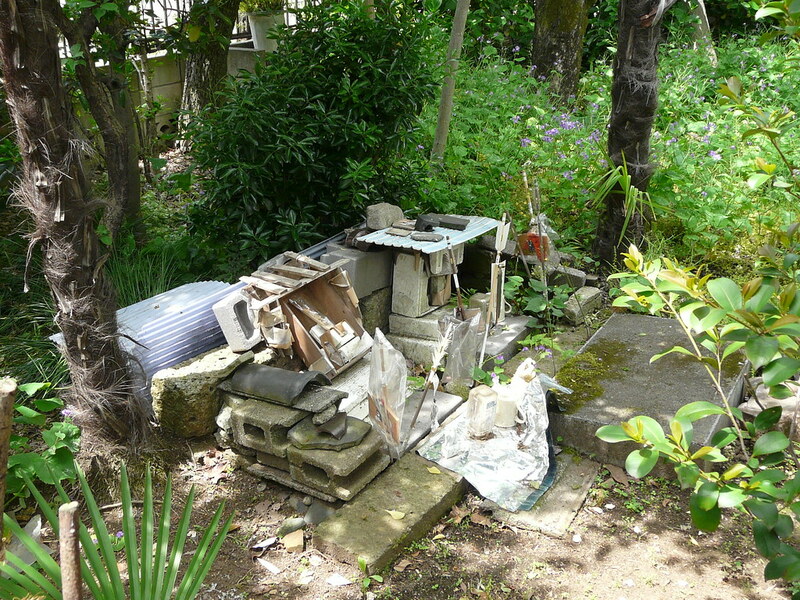 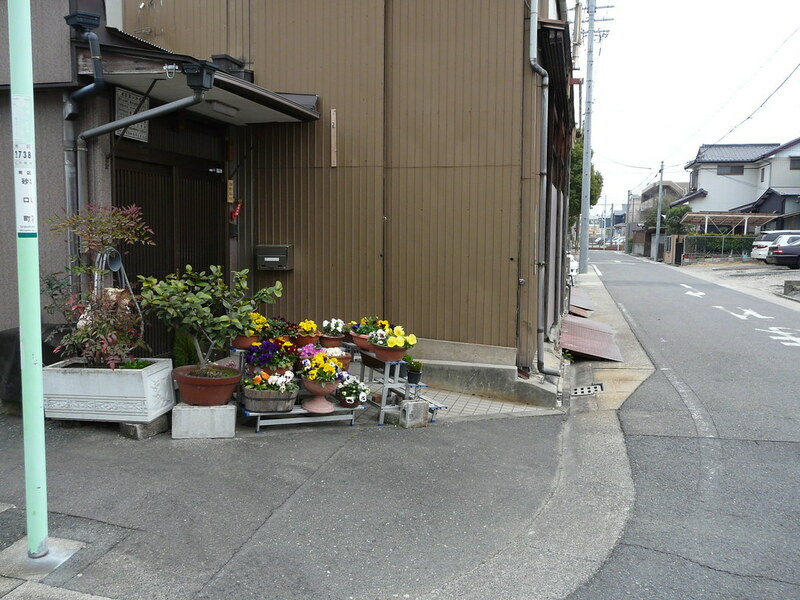 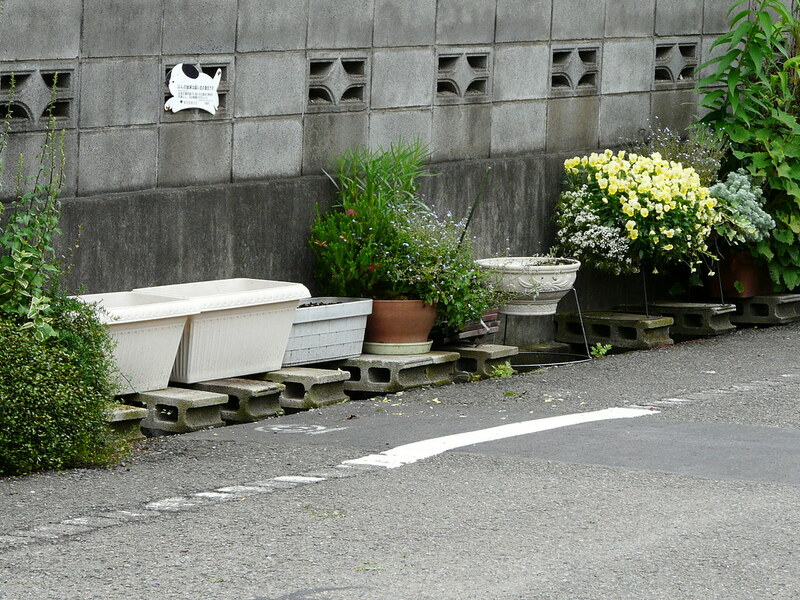 While making delightful use of the only outdoor space on the cramped corner plot (molded right to the edge), this garden guides visitors to the desired approach to the front door and presumably cuts down on hit-and-run pamphlet deliveries. 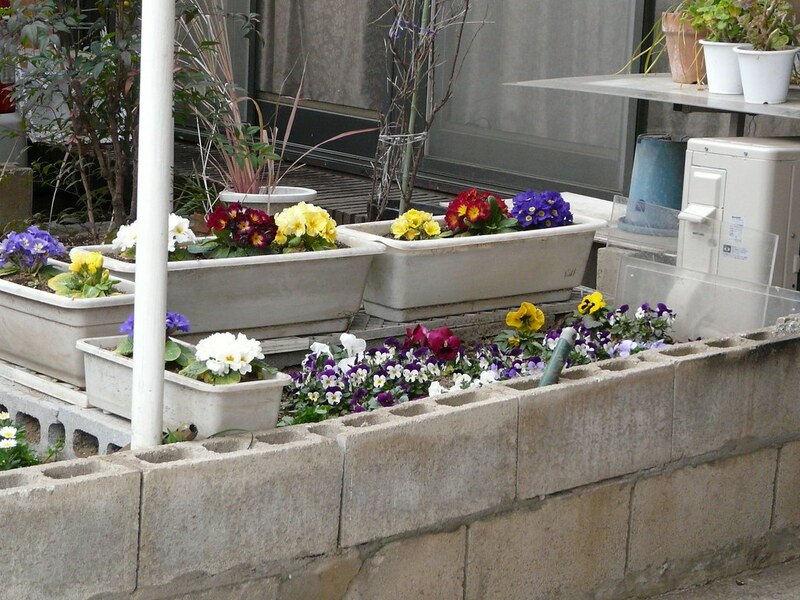 Two tiered gardens constructed from plastic planting shelves and old computer desk. 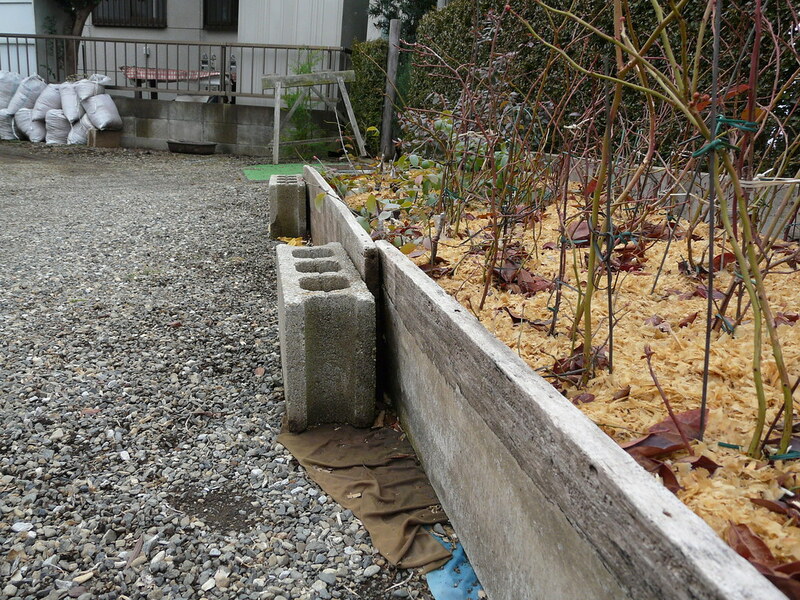 Plot made of breeze blocks and plastic planks. 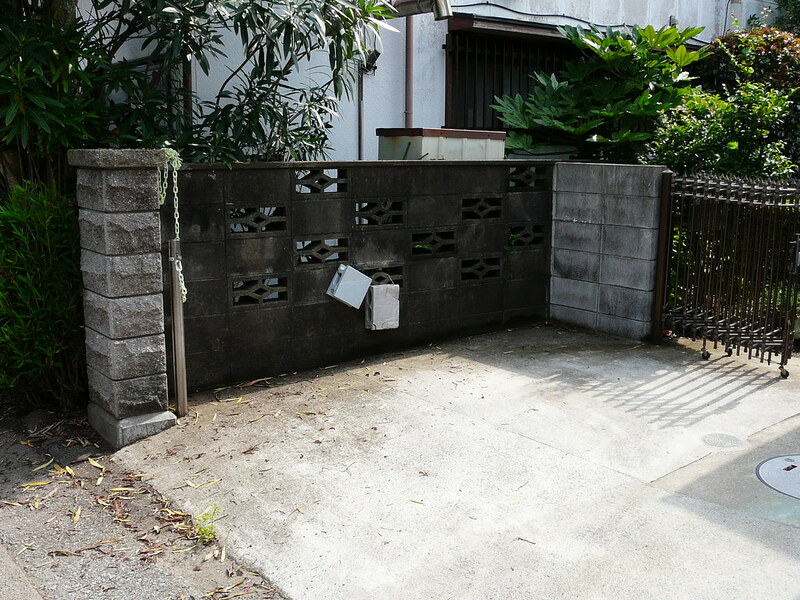 Breeze blocks even out too-large entry steps. 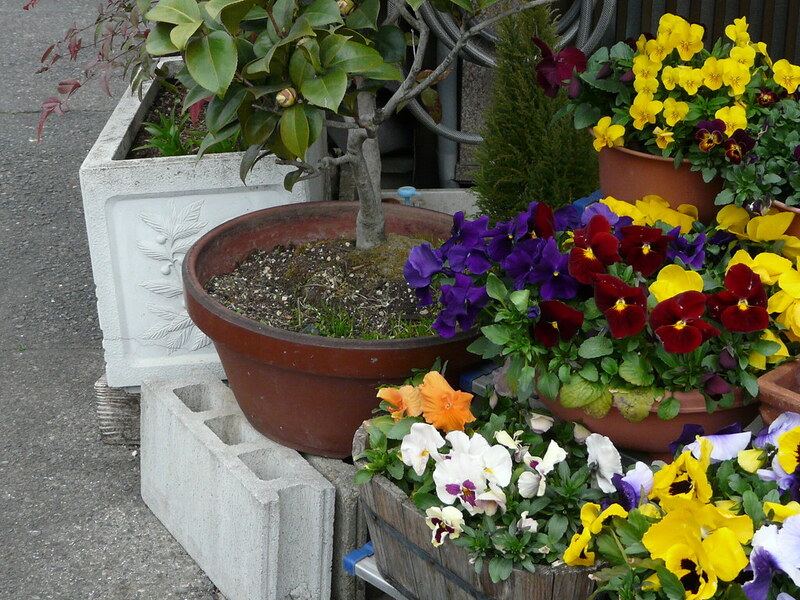 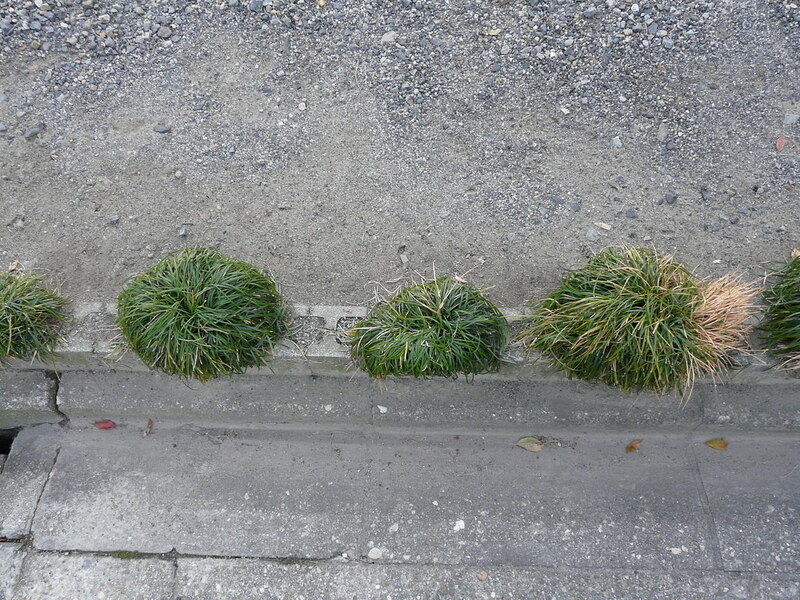 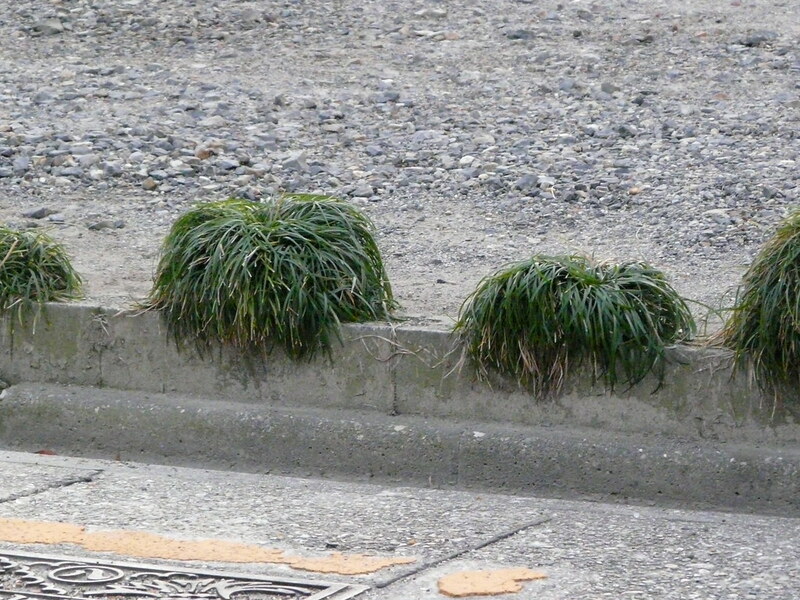 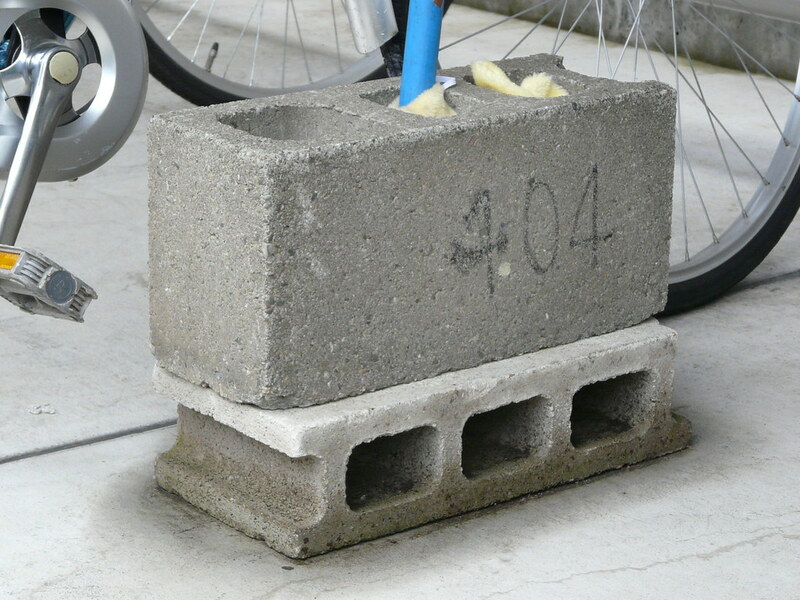 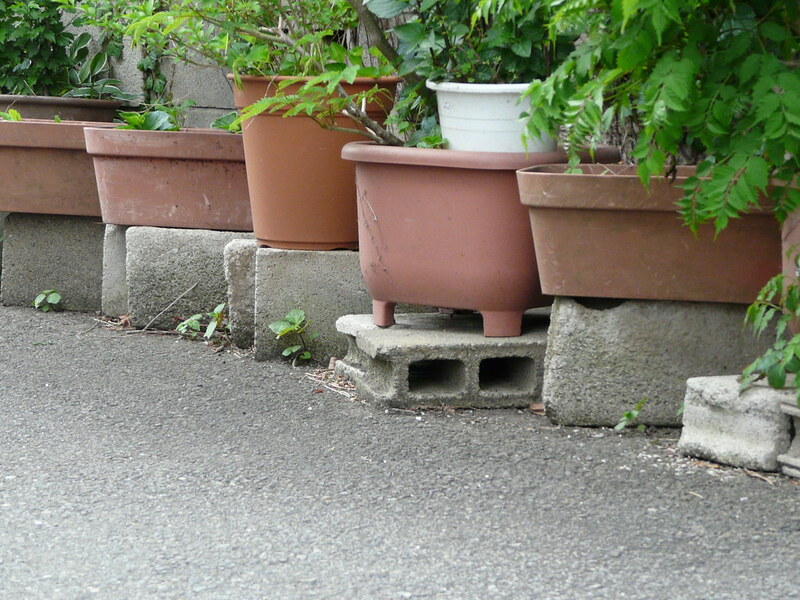 Breeze blocks that form the edging of a carpark double as sturdy plant pots. 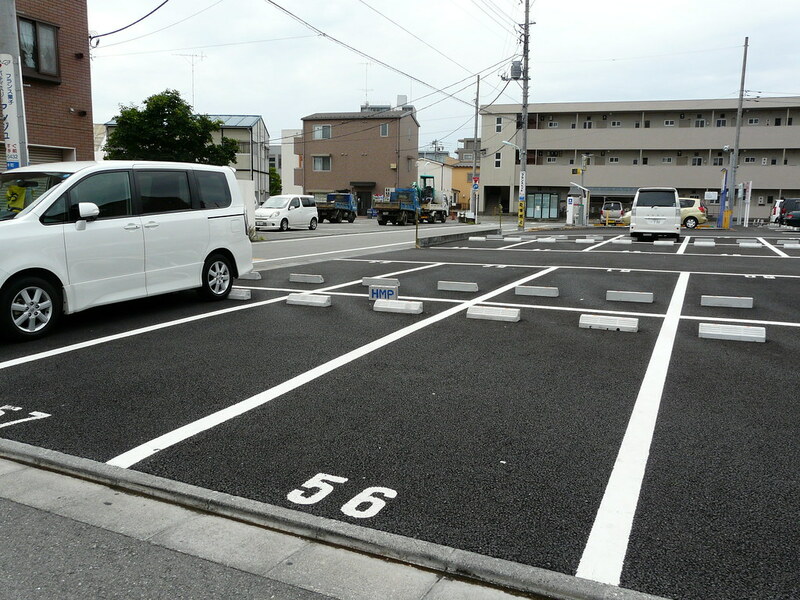 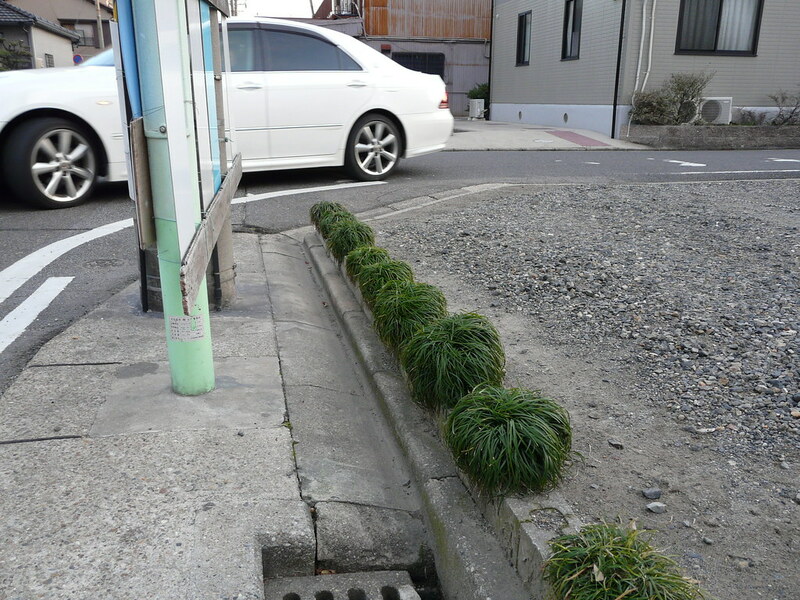 Parking for the local hairdresser is marked out with painted breeze blocks. 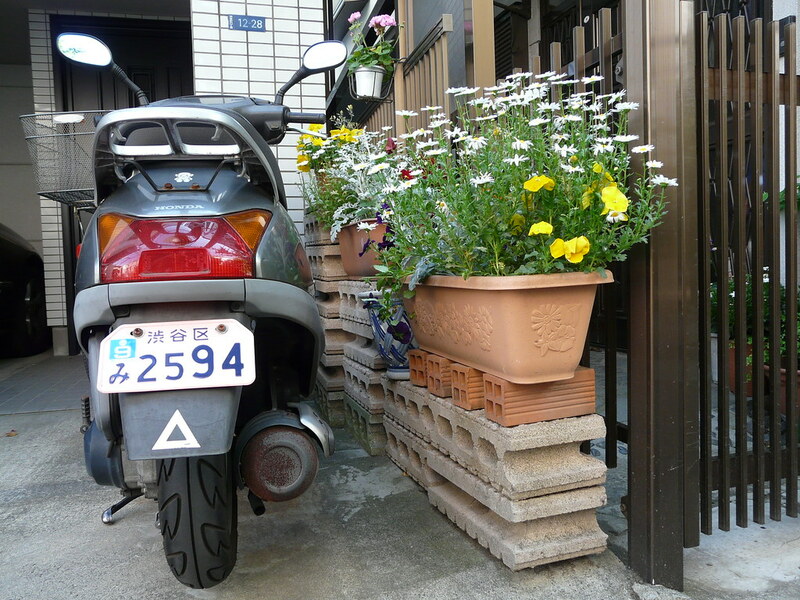 Robust, temporary, practical. 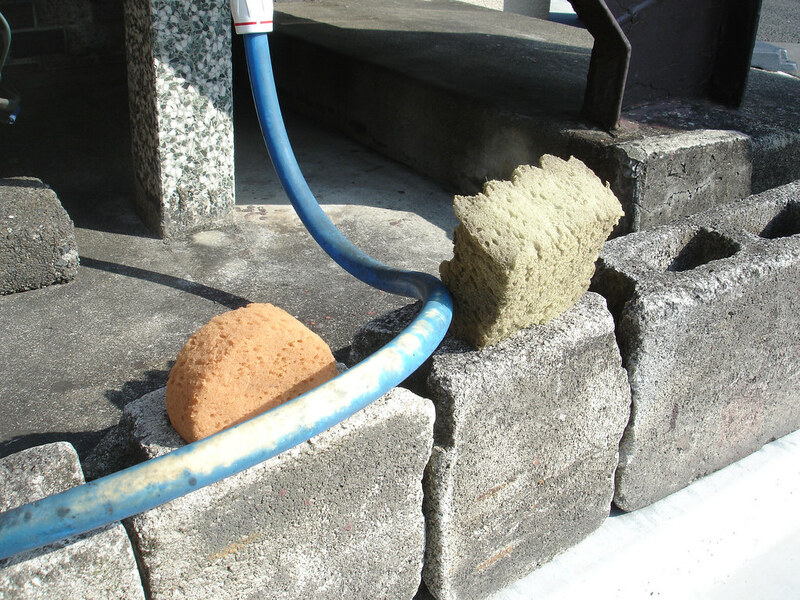 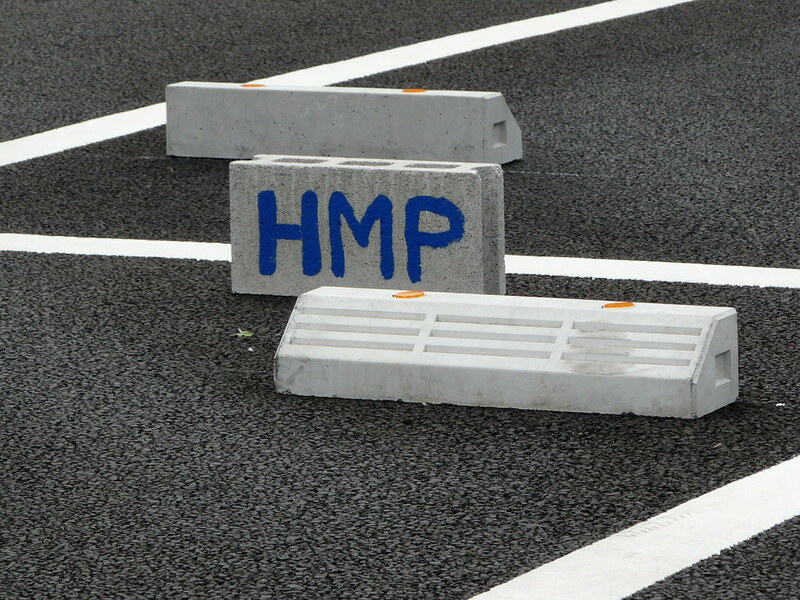 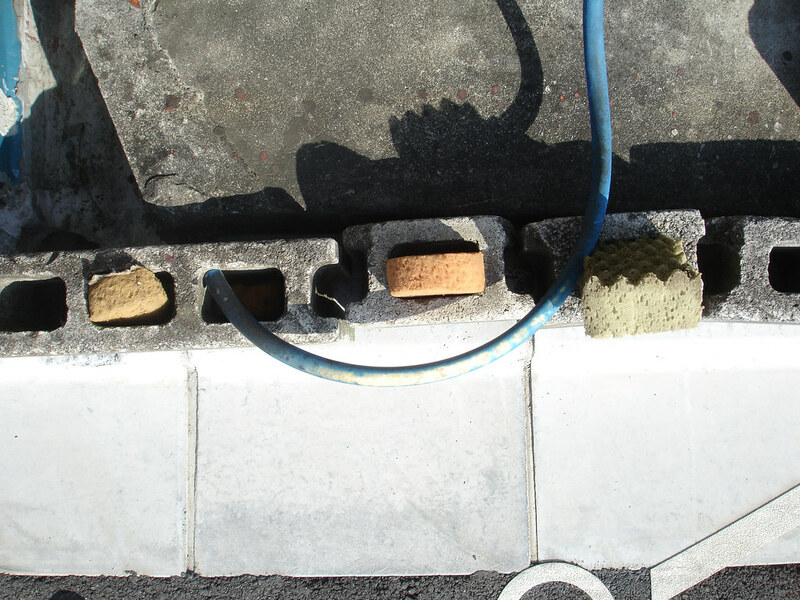 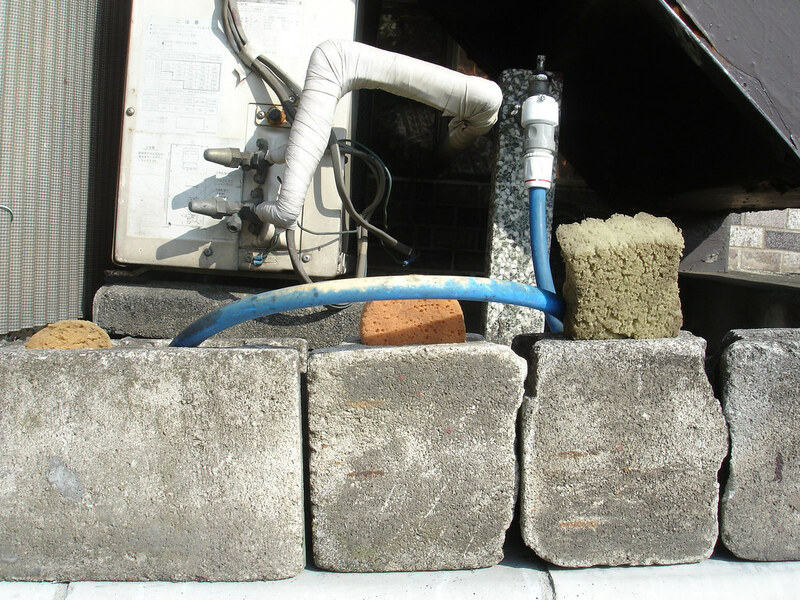 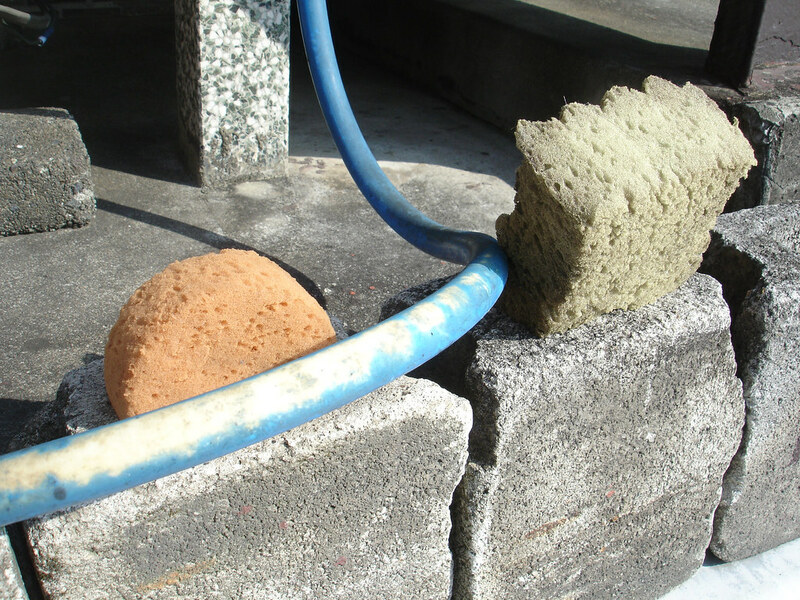 Sponge breeze blocks affixed to concrete breeze blocks with string form a safety bumper for errant parkers. 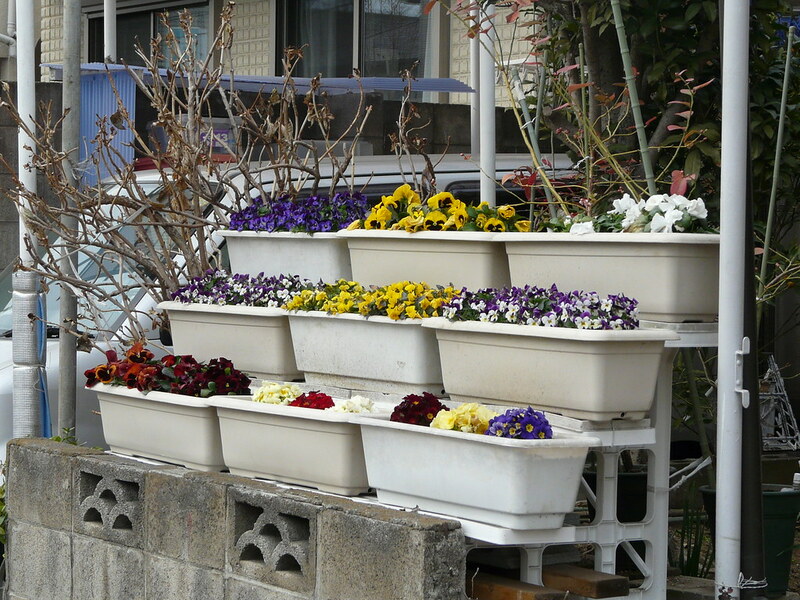 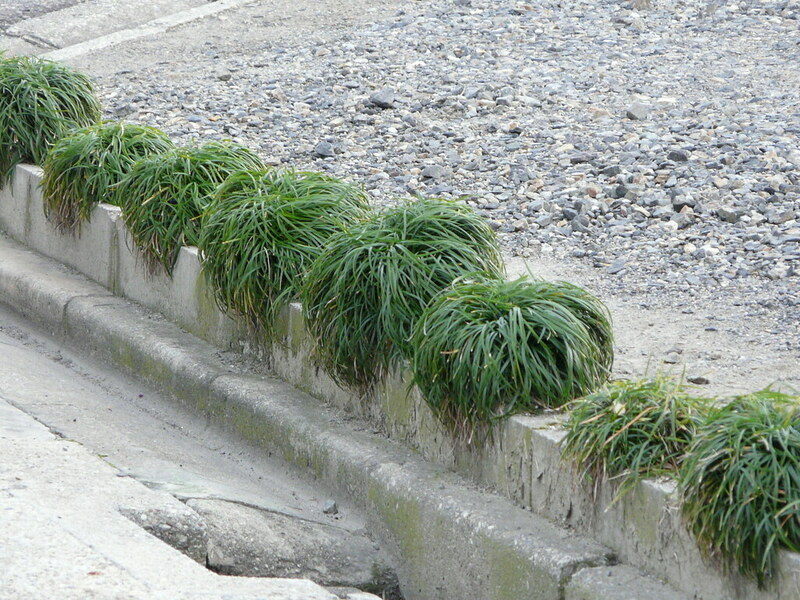 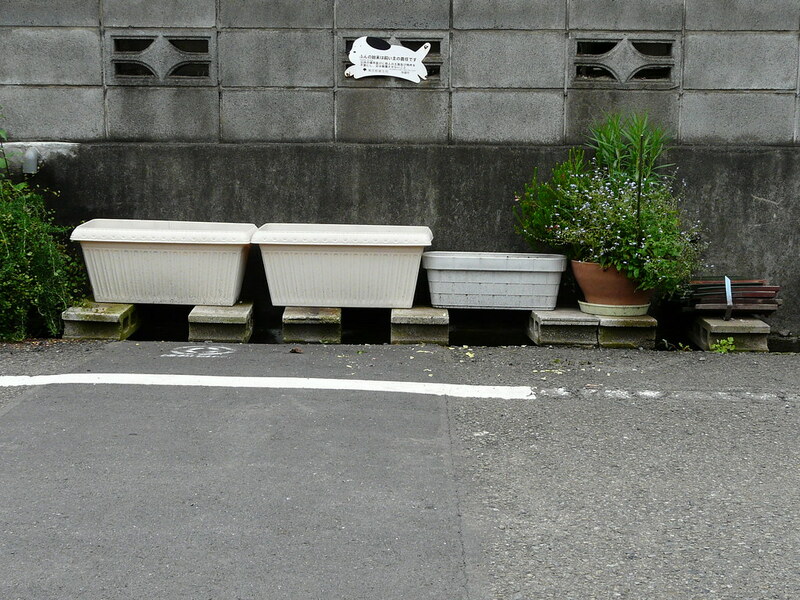 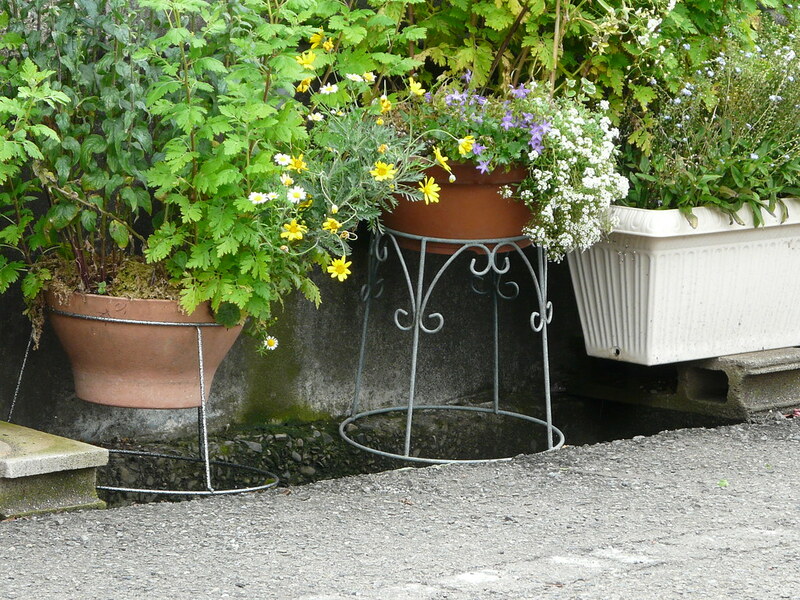 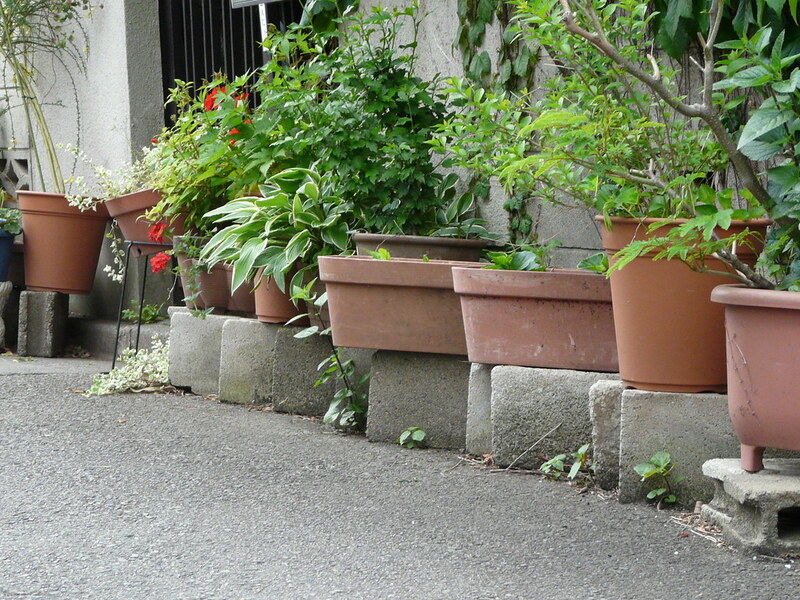 Breeze blocks and wire planters bridge the stormwater drain, providing extra space for a curbside garden. 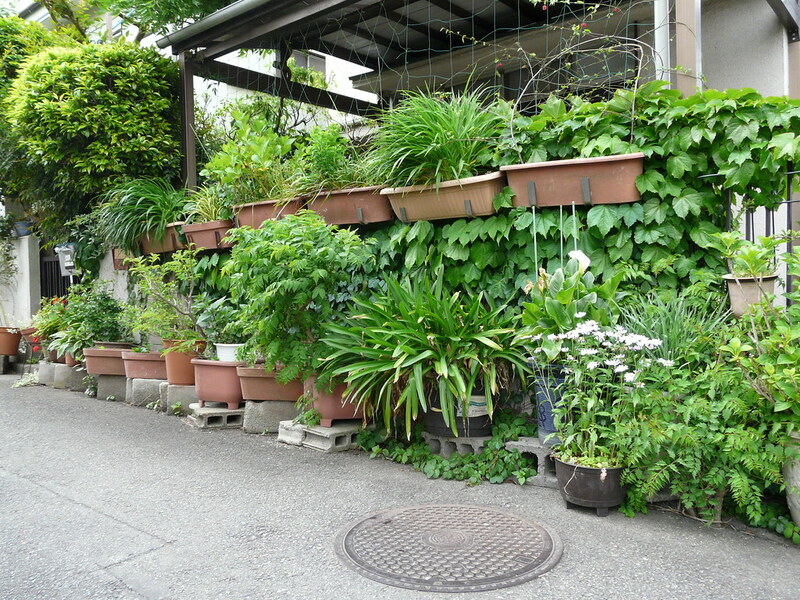 Green wall constructed from planters, breeze blocks and netting. 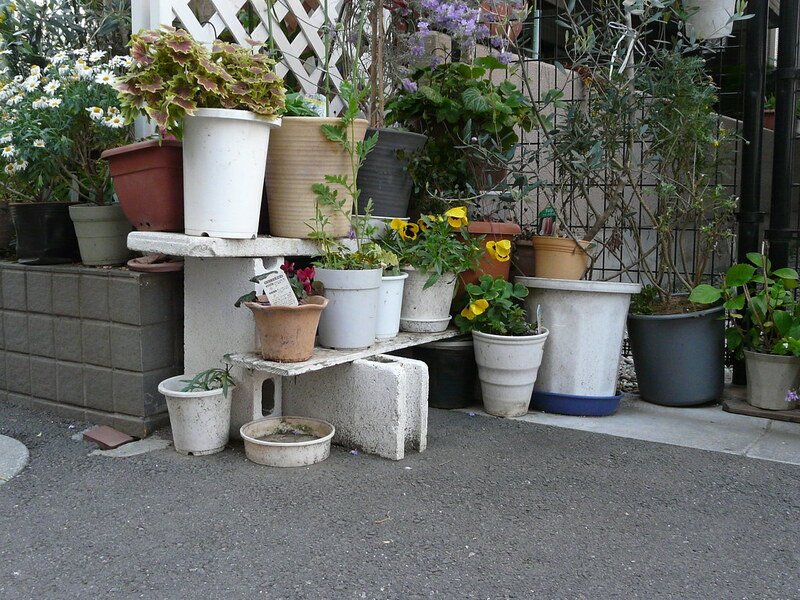 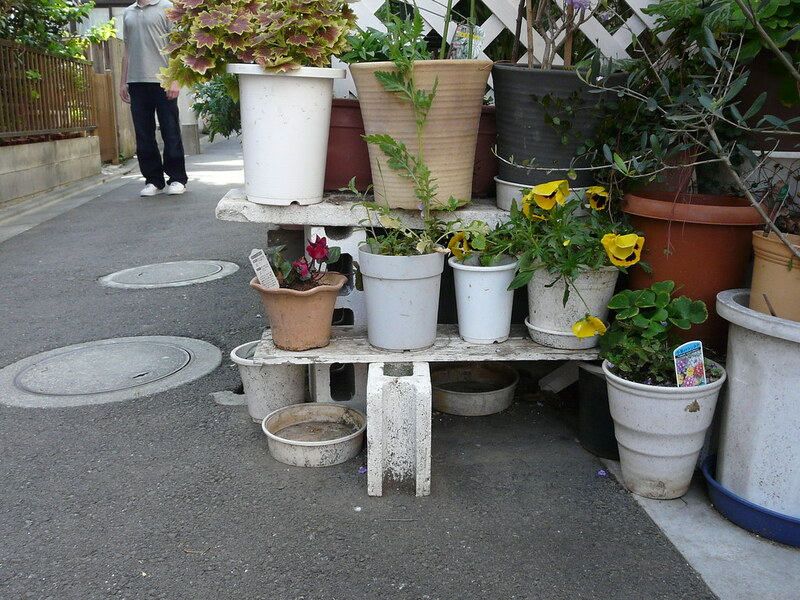 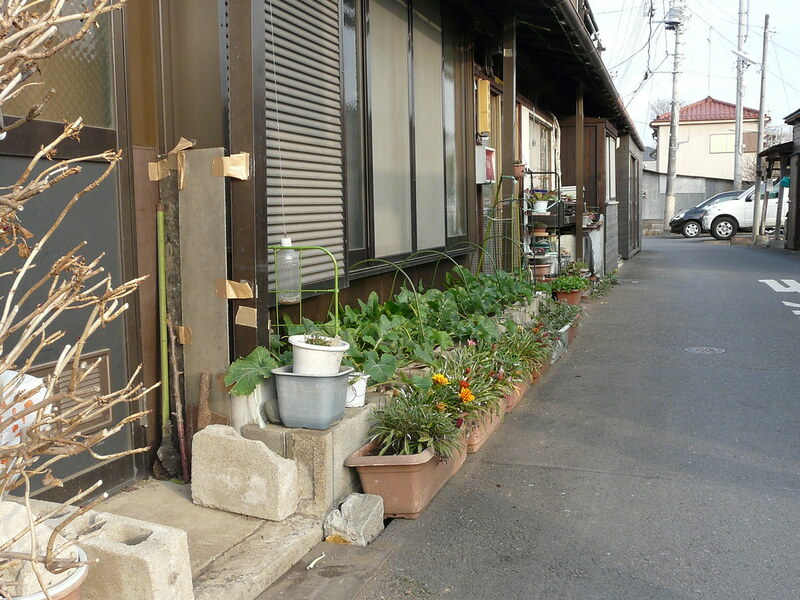 Bricks and breeze blocks form a tiered pot plant garden in the back streets of Harajuku. 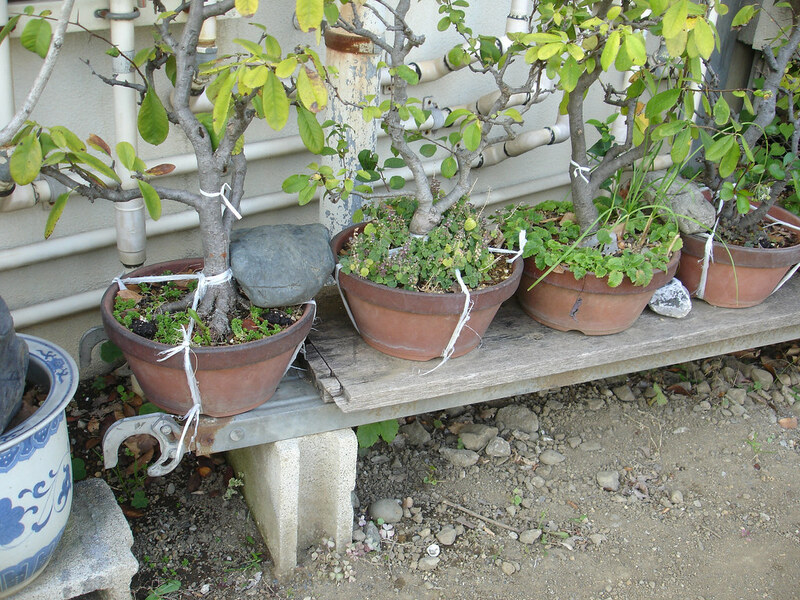 Bonsai trained/supported with string on a breeze block shelf. 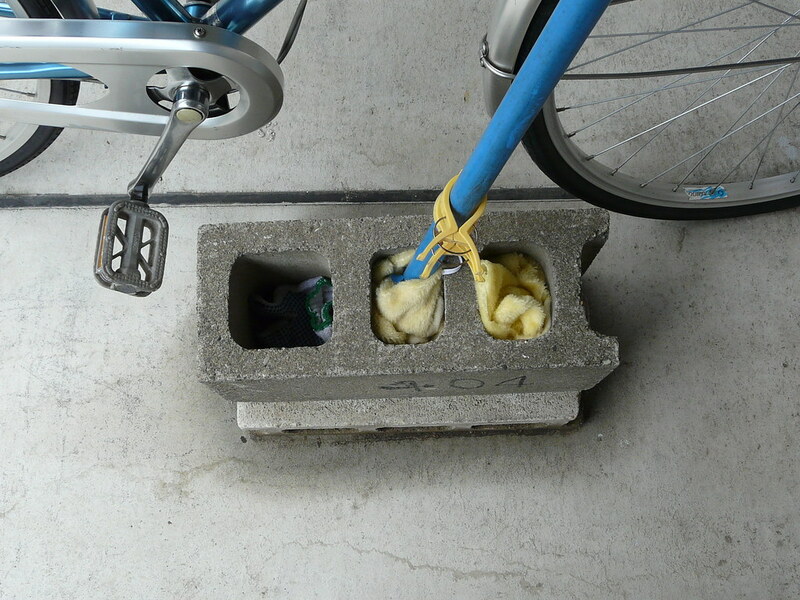 Breeze blocks form a simple storage set for sponges and a hose. 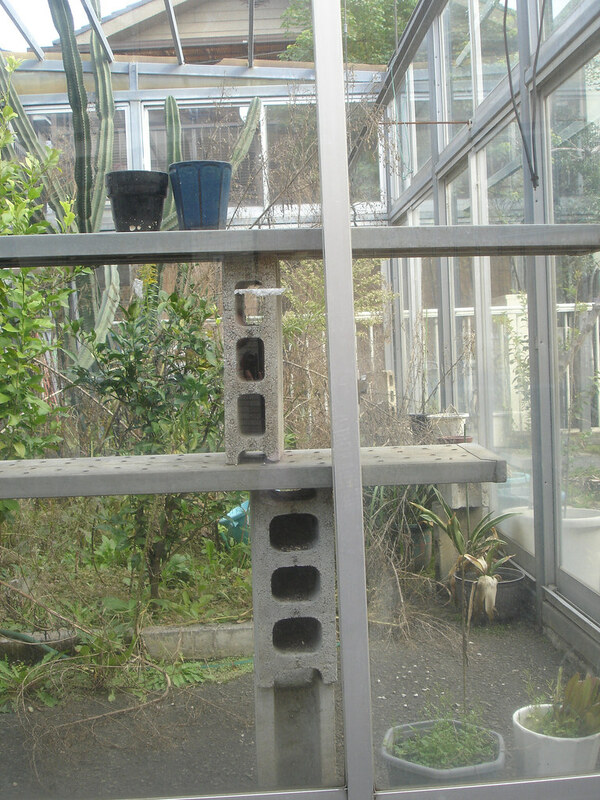 Breeze blocks support shelves in suburban green house. 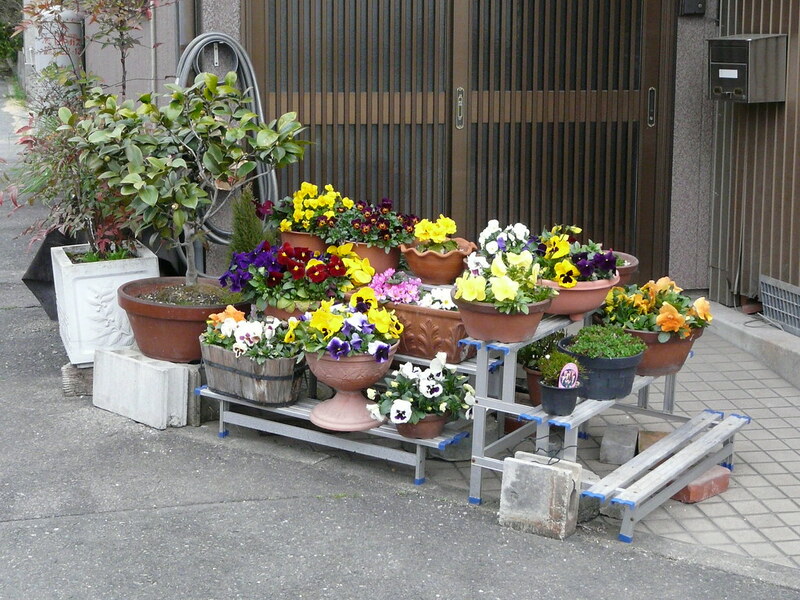 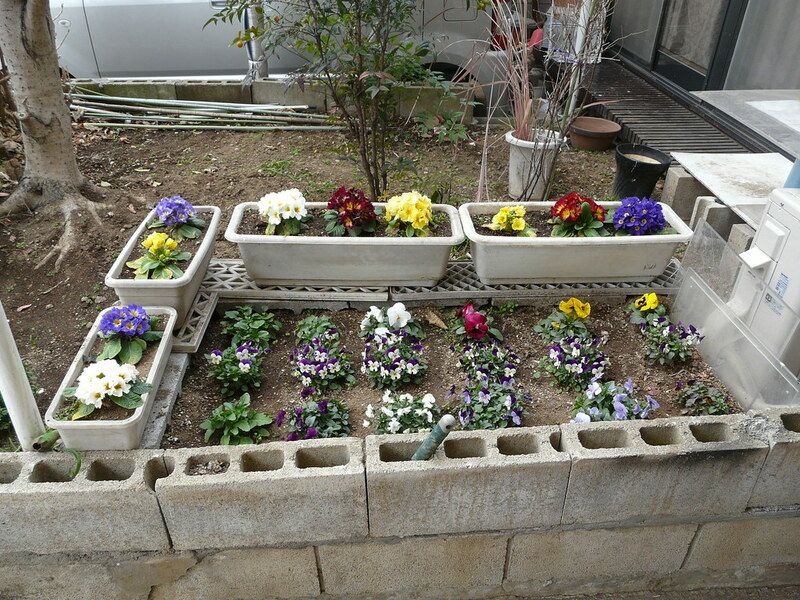 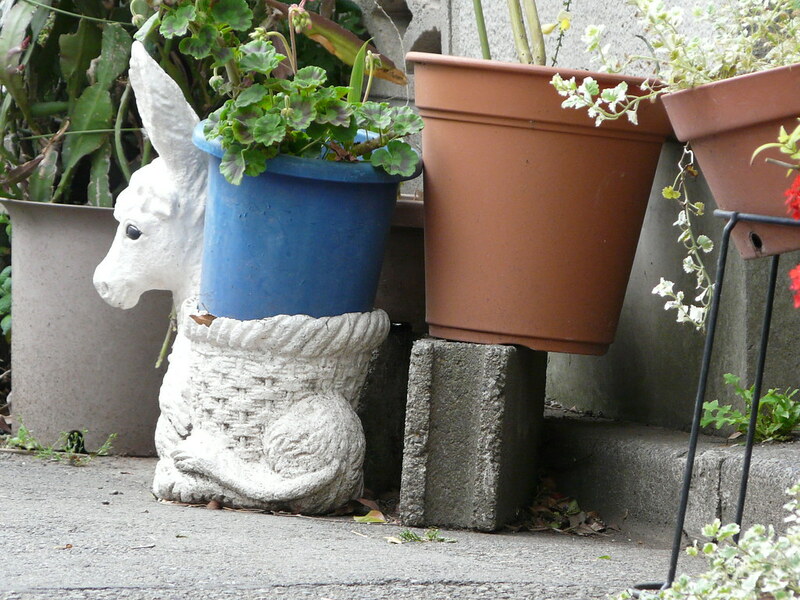 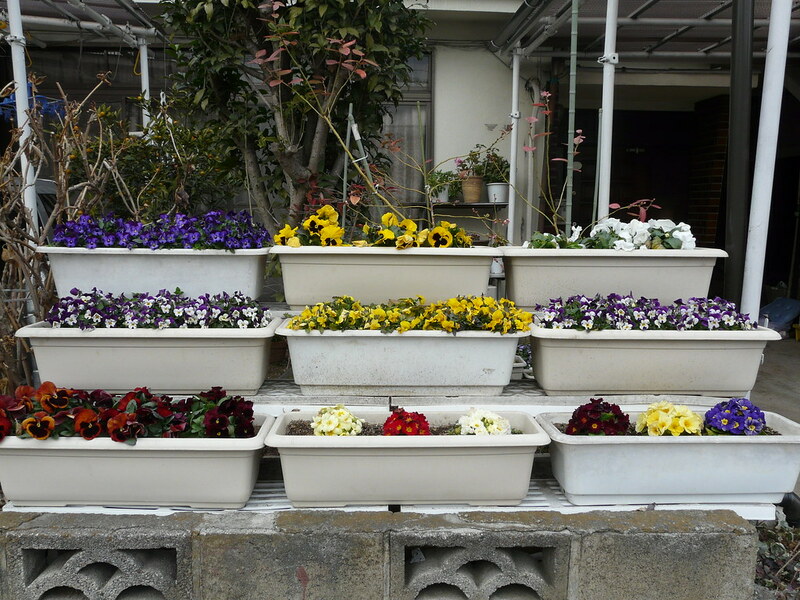 Front-of-house planter garden fashioned from breeze blocks. 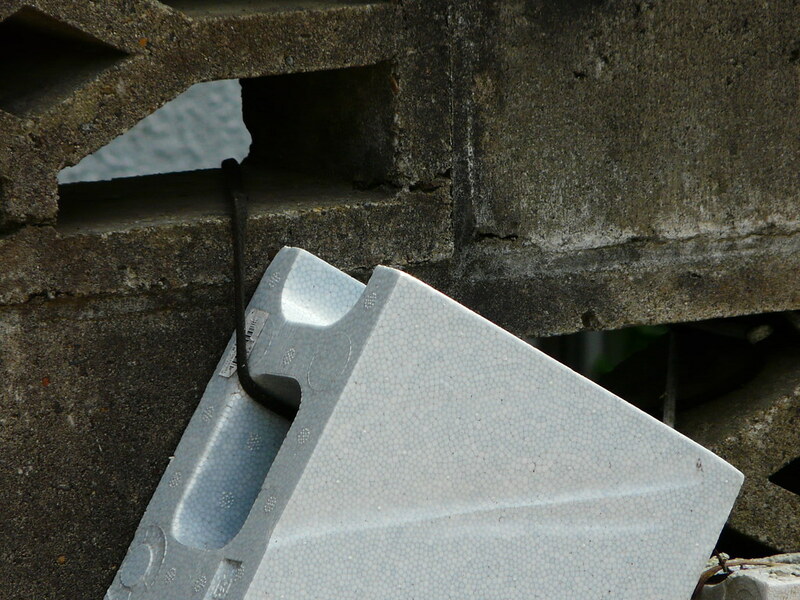 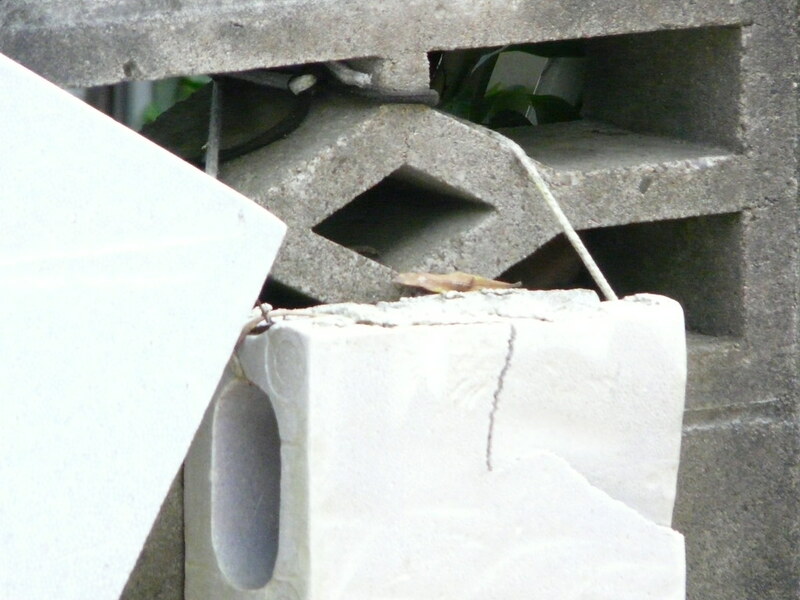 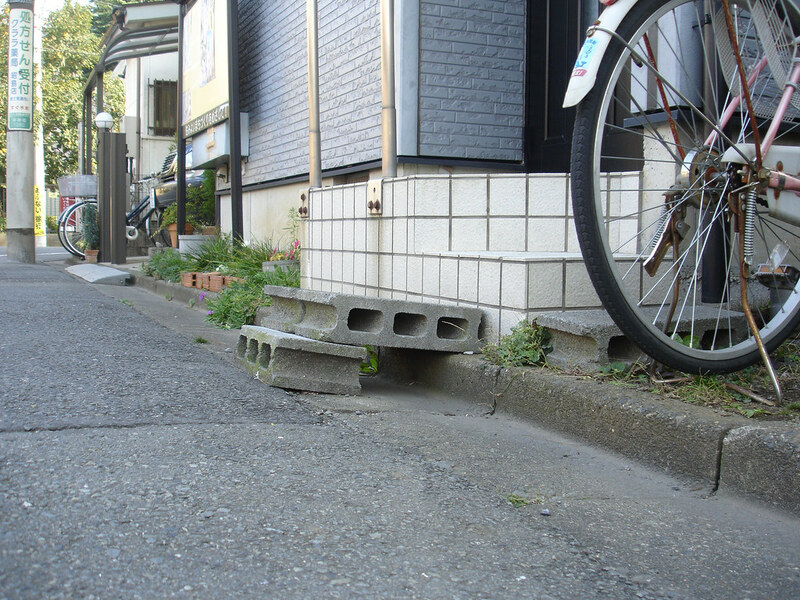 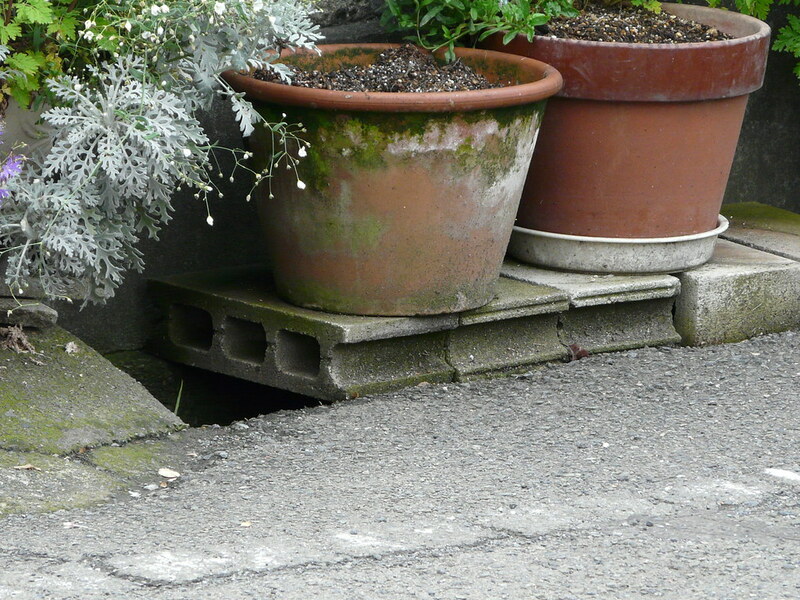 Note broken block wedged into drain to secure planters in front of breeze blocks. 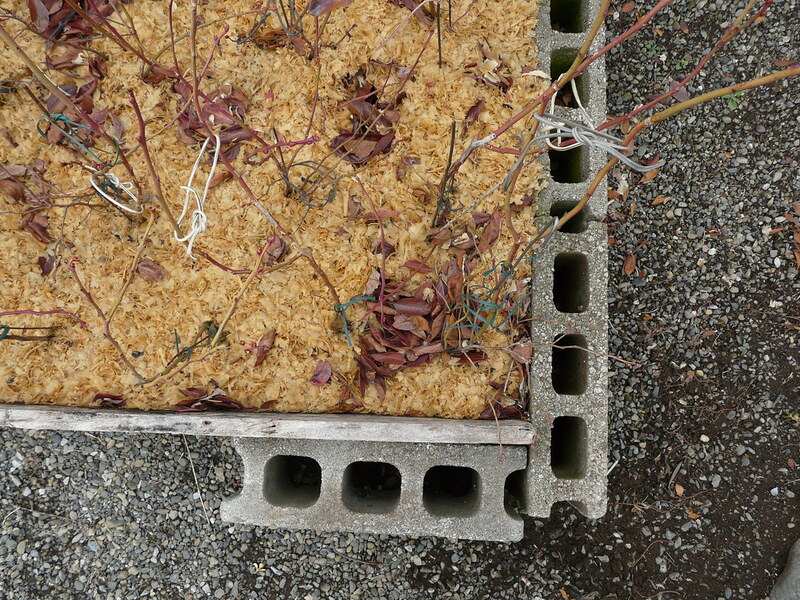 Note also that holes in breeze blocks are filled in with dirt and used to support the plant trainers spanning the width of the garden.